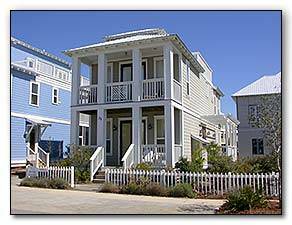 Seabiscuit, a beautiful, three-story, custom-designed home located in the widely popular Summer's Edge - a new family beachside community located between Seaside and Rosemary Beach on the south side of 30-A. Complete with lounging decks and fabulous GULF views, the Seabiscuit is adjacent to one of two community pools and just a short stroll to the pristine beaches (50-75 yards) over a private beach walk-down. Our home is tastefully furnished with antique pine and East Indies-style furniture, slip-covered sofas, and a fully-equipped gourmet kitchen with all stainless steel appliances. 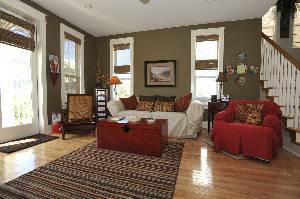 The floors in main living areas and bedrooms are all hardwood. The spacious first floor living space includes a 37-inch Flat Screen TV, DVD, and VCR, and a gas fireplace for those chilly winter nights. With three master suites (2 king size beds and 1 queen size) and a kid's bunk area, the Seabiscuit is a wonderful place for families with children or a group of friends to vacation. The tower room and large sun deck makes it all complete with a pull-out sofa bed and a mini-bar overlooking the Gulf! Complete your day with the sunset and gentle breezes over-looking the Gulf of Mexico. The Seabiscuit has such a relaxing atmosphere, the only decision you will have to make is whether to spend the day at the beach, or pool, or golf course, or shopping, or bicycling, or hiking, or just taking a nap. What a beautiful and relaxing home! Thank you for sharing your home with us. equipped home. There is everything you wuld ever want or need! We especially enjoyed the top deck this weekend. What a view!!!! Thanks again. We hope to visit again in the future. We were fortunate to have a week at Sea Biscuit at the end of May 08. What a fantastic time we all had. 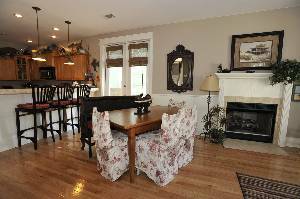 The pool is mere steps away from the front porch and attracts a number of other families staying in the community. Our 5 yr old quickly made new friends and the 1 yr old had the time of her life floating around and taking in the sights. Thank goodness for Grammie and Nana to babysit and give Mom and Dad a chance to take in the cool evening breezes off the Gulf while enjoying the view from the tower. We were all most impressed with how homey the house is. Other rentals on the street were stark and cold compared with the loving warmth that the owners have given to Sea Biscuit. Everything one could ask for is already on hand in the house. We truly are looking forward to our next opportunity to visit again. Your home is very tasteful and you feel very welcome. I wish the weather was warmer but much better than Indiana. We sat out on the sun deck a few afternoons. We all loved your beds. They are so comfy. Saundra read a few of your books and we watched Red Eye, Flight Plan and Josh enjoyed Ninja Turtles. He also enjoyed riding the bike. We hate to leave. Josh wanted to take the house home and Saundra and I wanted to take the beds!!! In your Seabiscuit, with its under stated elegance, I have renewed my spirits and found easy relaxation. Being a "dabbler" in acrylics, I have admired the art work. The best has been my nights in your daughters bed where I have taken this old body that is bolted together and experienced sheer peace!! The annual Well's family vacation has once again been a hit!! With 7 kids and 6 adults, we all fit perfectly. My husband and I discovered the best blessing of all here at the Seabiscuit - we are expecting our 4th child!! We have three boys and are hoping for a GIRL!! We've had a great trip this year and will be back next year!! What a wonderful place to celebrate an early Christmas with our families. We loved the Christmas decorations which made the house ever more beautiful. There are so many reasons that your house suited us perfectly - a ground floor bedroom for our 88 year old parents, a variety of decks for meeting and talking - plenty of space for all. We are so happy we found you on the internet. What a wonderful way to spend the Thanksgiving week. The weather was perfect. We spent every possible moment on the beach and in the water. Your home is lovely and very comfortable. We've been blessed by our time here. Many blessings to our family. Hi!! Our fourth time at the Seabiscuit. Thanks for the use of the kick boards, rafts and sand toys. Our son, John, loved to be buried in the sand and we used the big shovels daily!!! Thanks so much!! Until 2008. Thank you so much for letting us stay at your great house!! We had so much fun!! The beach was great, the weather was perfect and we all got great tans. We can't wait till next year, we hope to be back!! Morgan loved the flip flops on the wall in the downstairs bedroom!! Thanks again. We really enjoyed Seabiscuit. 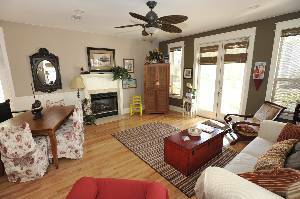 The weather was grand and your home just the right size for the Sheffield, Hallmark clan ages 1 to 60. No one wanted to leave!! Highlights: The pool, the beach, the porch swing, but mostly just being together. Summer 2008 can't come soon enough!! We absolutely loved the Seabiscuit and Seagrove beach and had the best time!! Perfect weather, crystal clear water, and beautiful beaches. We were in heaven!! We enjoyed the use of the bikes, very, very, much and also the beach chairs and umbrellas. The decor of your home was very well done. The unique paintings add to the charm of your home. 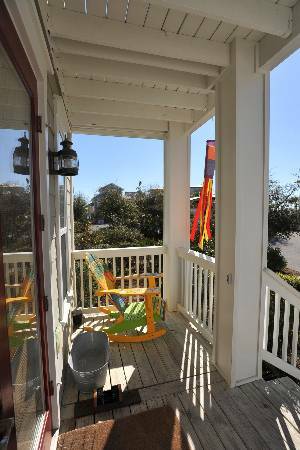 Love the swing and Margaritaville chair on the front porch. Great location to access the pool and beach - Summer's Edge is a fantastic place to vacation. What a wonderful family vacation. We all adore the Seabiscuit and are ready to come again. The grandchildren prefer this to Hilton Head and Sea Island and so do we. After being here only 3 hours, our Mary Mitchell (age 7) said, "this is my best day ever!" Thank you so much for sharing your "sea home" with us. We had a wonderful time here in the Seabiscuit!! Not a stone was left unturned when you stocked this house. We had everything we needed plus some!! Great weather and clear water !! Mid May is the perfect time to come!! It's fifteen minutes before "leave" time and the cleaning ladies are outside waiting in their car so we must go. Once again we loved our time in the Seabiscuit - even more than last year, if that's possible. 80's and sunny all week, yet early enough in the season that not many around mid week. It made us feel like the pool and the gulf were here just for us. Hopefully we'll be back again next year - We truly love it here. Thanks. Thank you for letting us stay in your beautiful home. Everything about the house is great! The beach was wonderful. We really enjoyed the crow's nest and the great beach view. It was sunny most of the week so we enjoyed many hours out at the beach and by the pool. The bikes and beach chairs were put to use!!! Overall we had a fantastic vacation and don't want to go back to the cold weather in KY. Thanks again for letting us stay. We had such a great time here at your place. Your home is beautiful and the view from the windows peak is great as well. We ran in the 5K and 1/2 marathon on Sunday in Seaside and had a blast doing it. But coming back here to a great home was nice after all that running. The weather was windy and cold but in the afternoons the sun peaked out and warmed us up a little. But no rain in the forecast which was nice due to our running!!! Thanks so much for sharing your home.....we will definitely be back soon. We absolutely loved staying in this beach home. It has many amenities and felt so much like home that is was actually quite difficult to leave. The home owners are very nice people and will do anything to help make your stay enjoyable. I highly recommend this home for your vacation. We thoroughly enjoyed your home and hope to make this an annual trip with our friends. The weather could not have been more enjoyable and the beach more relaxing. Everyone mentioned how lovely your home is and how well put together everything was. Loved it!! Thank you so much for your lovely home. Our family really had a wonderful time as we were here to celebrate a marriage at Watercolor. We appreciate the home decor and the art work of your children. Seabiscuit is a great name! Loved it all!! Loved our vacation, the house is decorated beautifully. We loved the water, both the gulf and the pool - my daughter Emily never wanted to get out! The diet begins Monday. Super!! We loved our vacation - the weather, the house, the beaches...this was our first trip to the Emerald Coast and we will be back. Thank you. We were so comfortable here! So lovely - I'd love to go shopping with you! Thank you so much for sharing your home - it was a wonderful "home away from home". The weather was gorgeous, our kids loved the decks (and games) and we had wonderful food the whole week. We had a wonderful family time in your beautiful Seabiscuit - thanks for sharing it with us. We had a lot of fun staying at the Seabiscuit. The beach was wonderful except for the jellyfish. Thanks for sharing your home. This was our annual trip to the beach, but our first time staying at the Seabiscuit. With 4 adults and 5 kids, it was just the right size!! We enjoyed the beach and the pool, the concert at Seaside, lunch at the Blue Luna Cafe and Cowgirl Kitchen! We ate our annual dinner at the Red Bar in Grayton which was wonderful as always. The seafood market (Goat Feathers) was awesome for some of our meals at home. We really enjoyed Summer's Edge and would love to come back next year for more memories! Thanks so much. This week flew past quickly as all wonderful vacations seem to do. Our family of 8 enjoyed all the amentities of Seabiscuit and Summer's Edge. Thanks for sharing your home with its many amentities. We truly made memories that will remain with us in our hearts and minds. We had a wonderful family vacation at Seabiscuit!! We loved the ocean views and the third floor getaway. Very relaxing - even with a one year old and a three year old! We'd love to stay another week in your beautiful home, but our money ran out (ha, ha)! We hope to return - maybe in the fall. We also hope you get to enjoy your own beach house this summer! Thanks for the hospitality! We never want to leave ... What a great place to stay and build wonderful family memories. Your home is beautiful and absolutely perfect. We were comfortable the moment we walked in. Thank you so much for a very fun, relaxing week. Seabiscuit will always be a fond memory. Would love to come back. Loved all the decks and the porch swing was our favorite. Seagrove is just perfect the way it is, tell them to stop building so it doesn't get too big. Enjoy this beautiful beach treasure!! We have had a lovely time. You have a beautiful place, well appointed, and comfortable. The area is incredible. The beaches like sugar - the water like tourquoise and the grandkids loved the pool. Thanks so much for allowing us to be here. We had a lovely relaxing time!! We have all been blessed by you and your hospitality. Make sure you walk to the coffee house, they are so nice in there. Taste the wine, listen to the shores, relax...enjoy. I am sitting at your kitchen bar with the door open listening to the sound of the waves and seeing a clear blue gorgeous morning. God is so good and he has blessed you with this beautiful beach home - Enjoy every minute with your young children. We had a perfect week. Every day was warm and beautiful. 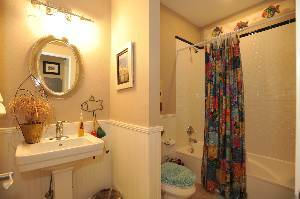 Thank you for sharing your home - everyone loved the decor and comfort. The kitchen is definitely well equipped!! We loved the Seabiscuit. The kids loved the pool and bunk beds. We have been spending New Years in Seaside for the past 10 years - 3 couples and 3 kids and there will be more kids for next year - we all want to come back to the Seabiscuit. The Site's and Compton's had a wonderful Thanksgiving and the accomodations were quite grand. We were here with 37 other friends and family sharing 5 houses around the cul-de-sac. This was our 30th annual Thanksgiving celebration. We had tremendous fun! Thanks for sharing the beautiful home. This house is better equipped than mine! No minor detail has been omitted. What a treat!! I am just madly in love with this house - hopefully we'll have a reunion next year - many thanks to the owners. This was our first trip to the Emerald Coast of Florida and we loved it! Great weather, clear water, and beautiful white beaches were a treat for us Northerners. Seabiscuit was the perfect house for our family of 5 (3 sons) with the numerous sleeping areas and close proximity to the beach and pool. We enjoyed the many great places to eat from here to Destin. Good morning Sunshine! Love the house, not the new neighbors (under construction). Seabiscut is adorable. The area is great for the whole family. The kids loved the beach and pool. We enjoyed the early morning bike rides to Deer Lake. Thank goodness we had those wake up calls. Seabiscut was a gracious host to us all. The teens totally enjoyed the tower room. 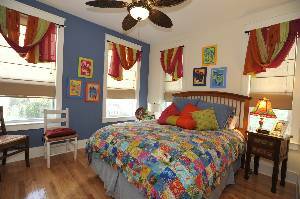 The parents enjoyed the beautiful decor and very roomy accomodations. This house is the most coolest home that I have ever stayed in. If I could change 1 thing it would be nothing. This house is the best home in the world. It has everthing that I love. Never change anything. I was so very 'lucky' to have met you two last summer as you were readying this wonderful home. You have done an outstanding job. Came this year with my three daughters and husband. We had a great time. The weather was beautiful and all your special touches are truly appreciated. Have even booked it again next summer. Sorry we missed you. Arrived early on May 31, just missing you two (the crib lady was leaving and told me). What an awesome way to spend Easter 2003! We had a wonderful time in Sea Grove. Great house, beautiful weather and good food! Thanks for sharing the "SeaBiscuit" with us. Great house, great beach, but cold, rainy weather. The cottage is darling! We thorougly enjoyed the decor and appointments. This was our first trip to this part of Florida and I know we'll return to these beautiful beaches and grand area. 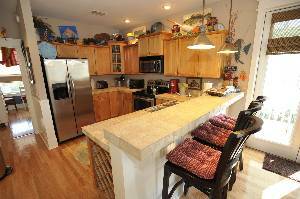 Thank you for allowing us to be guest in your beautiful appointed beach home. We enjoyed all the wonderful amenities, down to the "feather" pillows and gourmet kitchen! Your tower room was a fun place to gather and afforded us an awesome view, both at sunrise and sunset. We hope to return in 2004. Rate does not include 11.5% sales tax and a 200.00 cleaning fee. Deposit: 50% of rental deposit due to reserve the dates with the remaining balance due 10 days before arrival.